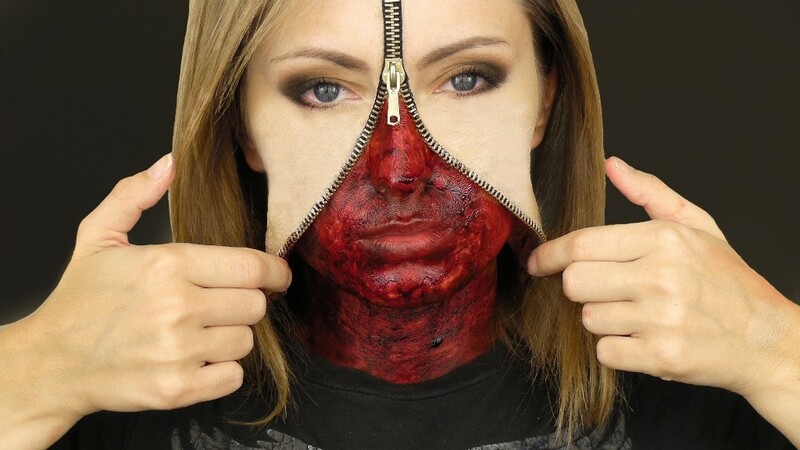 This zipper Halloween makeup is for those who have planned to scare everyone with their dread looks. Take your Halloween Makeup to the next level and amaze everyone. Always keep in mind that whatever you are doing you need practice and a little patience for it. You are capable of creating amazing master pieces but just focus on the thing. Here is a list of products you need to get this scary makeup look. These are some basic products for this look. You can always add what you like in this makeup look and spice it up with your creative abilities. For those who are not going to look very dramatic this year then they can stick to this look. Start with the foundation. You need foundation which is closer to your natural skin tone. Blend it with a damp beauty blender. This will make your skin smooth and there won’t be any roughness on your skin. Remember that this makeup look is not a fresh looking makeup. This is scary and dull and ghostly makeup look. So try to be messy too. If you want to work on your brows then sure why not. Fill them up and make them neat. Otherwise you can leave them as they are naturally because ghosts does not have a well-shaped and defined brows. Then take the red eye shade from your makeup palette and apply it all over your eyelid, underneath your lower lash line and on your cheeks as well just to give a very striking effect. You can use your brush or finger for the blending purpose. Do not worry if it gets a bit or a lot of messy because you do not need a perfect look. Start with applying a little black eye shade on it and smudge it on the outer corners. Do not go with a heavy hand with any shade. Always start from little and slowly build up the color. This will bring perfection even if you want to look messy. You also need to be looked bruised so for giving this effect keep blending the color and bring it down to the areas where you want to look bruised. Do not mix all. You still want layers of colors to be seen. Now how to apply Zip? This is very simple and easy. Grab your zip and turn it. You want to apply liquid latex on the back side of it. For a long lasting effect apply liquid latex on the edges, and on the whole area which is going to stick on your skin. Now place the zip on your face. It should be between your forehead and down to the sides of the nose. Zip should be in the center. If it is looking a bit edgy then apply liquid latex on top of it and let it dry. 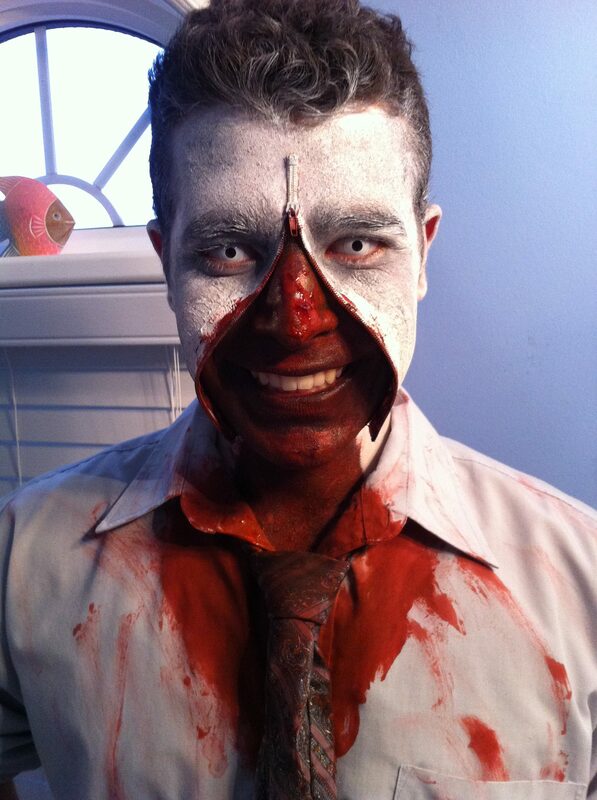 Apply some fake blood and done!